When the early Zionists looked for historical precedents of Jewish political independence, they found a natural point of reference in the Hanukkah story. The Hasmonean uprising was a turning point in Jewish history: for the first time since the Babylonian exile, the Jews fought a regional power and won. That victory led to the re-establishment of a politically independent Jewish commonwealth under a Jewish monarch for the first time since the destruction of the First Temple. And yet, the Talmud doesn’t even mention it! The question “What is Hanukkah?” gets an answer, all right, but it isn’t the answer that we expect. Instead of a history lesson, we get a colorful story of how the sole remaining jar of ritual olive oil for the menorah sufficed for eight days, until more could be brought—a nice story, but not particularly satisfying. What about the military victory over vastly superior forces? What about the resurrection of an independent Jewish state? Tell us about the real miracles—the ones that changed the course of history! But it wasn’t only the Talmud that was mysteriously reticent about the Hasmonean victory. The earlier Sages went to great lengths to obscure the underlying political and military basis of the holiday, along with the ensuing civil war. The books of the Maccabees were left out of the Jewish canon altogether. Why this seeming censorship? The answer may have something to teach us about the clash of civilizations. The culture against which the Hasmoneans fought was one whose values were at odds with those of the Jewish culture on a number of levels. It was an empire built solely on conquest, on picking up the pieces left by the ruin of earlier empires. Moreover, it was a failing culture. The Hellenism of the day was dying; the center of gravity of Greek political power had shifted to western Asia, leaving its original homeland increasingly depopulated and economically bankrupt. While the outer trappings of Hellenism were enthusiastically adopted by the Seleucid elites, its cultural institutions were missing or enfeebled. David Goldman, the author of Why Civilizations Die, highlights demographic decline as a factor in—or a symptom of—societal decline. As literacy and affluence rise, birth rates decline, such that civilizations can die of their own success! This is the fate that befell the Hellenistic society at the time of the Seleucid Empire. But it wasn’t only the Hellenistic culture that was in turmoil. Judea had never really recovered from the Babylonian exile some 400 years previously. The period between the return from Babylon and the Hasmonean kingdom is the Jewish equivalent of “the Dark Ages”. We have very little written or even oral history from this period: few names of sages or leaders. 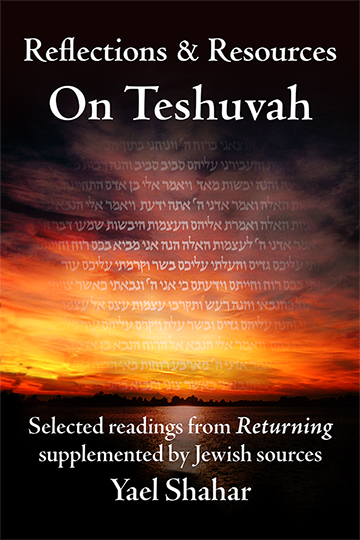 And when scholarship finally reemerges out of the murk of history, the leading Jewish sages have Greek names! Thus we have a clash of two fragmented cultures, each struggling for identity. While the Seleucid Empire shone in the reflected light of a brilliant but dying Hellenistic culture, Jewish society was struggling to relight the fires of its own cultural identity after the Babylonian exile. But if there are historical lessons to be learned from this sordid story, why did the sages of the Talmud not spell them out? It’s been suggested that the silence of the Talmud and Mishna about Jewish victories is primarily due to fear of the non-Jewish authorities. During the days of the Roman occupation, it wouldn’t do to recite past Jewish victories. Nor would it be a good idea to give voice to aspirations of independence later, while living under Babylonian and Persian rule. And yet, that’s not the whole story; this “queitism” appears to be part of a deliberate pedagogical program which started with the Tanakh itself. Biblical scholar Jacob Wright notes that the Biblical text consistently downplays—or omits altogether—tributes to military victories and state-centric monuments. He makes a good case for the notion that this was a conscious policy—an attempt to shift the nation’s values away from statehood and toward peoplehood. The classic biblical hero isn’t the warrior who valiantly dies in battle, but rather the man who fights only out of necessity and then returns home to care for his family. The biblical “draft exemptions” set out in Deuteronomy 20:5-7 are not for conscientious objectors; they exempt those who have something more important to do than going to war. Raising families and harvesting crops win out over fighting the king’s battles. But it may be that there’s a still deeper lesson in the way the Hanukkah story was handed down. The failing empire of Antiochus provided valuable practice for the far more serious threat of Rome—both politically and religiously. Unfortunately, the lessons weren’t learned in time. The national unity whose lack led to a disastrous civil war was still missing two centuries later. It may be that this is exactly what the sages of the Talmud were trying to put right. Even in the midst of a crisis of existential proportions, they could see that the political and military fight, though important, was not the heart of the matter. What mattered was that Jewish values themselves should be so well internalized that no wedge could be driven between the disparate parts of society. Had Jewish society been stronger in its identity and national ethos, its clash with Hellenism would have been far less divisive; Jewish cultural elites would have taken from the foreign culture what could easily be woven into the fabric of Jewish tradition, and calmly rejected the rest. 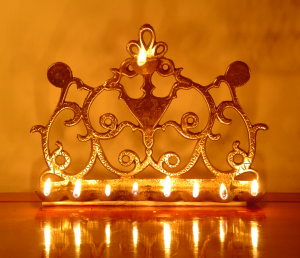 This lesson is subtly woven into the observance of Hanukkah. 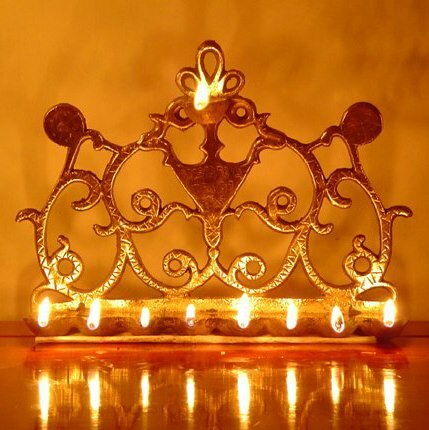 The hanukkiah is not lit in the private space of the home, nor is it traditionally lit in purely public spaces; rather, it is set out on the threshold of the home, marking the dividing line between private and public space, between the light streaming outward from the home and the light coming in from outside. And really, this is what the holiday is all about: defining distinctions between what is inside and what is outside—what values we assimilate from other cultures and what is best left outside, what customs and world-views uniquely define us, and what traditions and practices we can let go of in light of new circumstances. In the end, our light meets the lights of other cultures, and yet remains itself. And so we come to the secret of the answer given by the Sages. Pressed to explain what Hanukkah was all about, the Sages said nothing about the military and political victories, but instead brought forward a beautiful midrash that sums up the true miracle of that time: For all that we were dragged into a brutal war of brother against brother, of the settling of scores and the collapse of government; for all that we had so forgotten our own traditions that much had to be later recreated by Sages whose very names were no longer Jewish—still, our light did not go out. 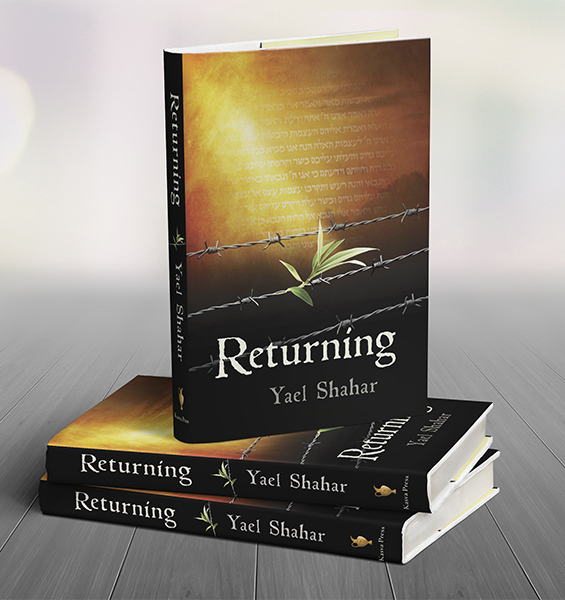 We came through one of the darkest periods of Jewish history with our inner fires still burning, ready to rebuild. Purim Torah: Or questions meant to cross a rabbi’s eyes!